I have found a way to save thread information without creating additional files, but still keeping the native file format of your embroidery machine. Many other embroidery programs are introducting their own, proprietary file formats to save meta data. StitchBuddy is always working on orginal files, allowing modifications down to stitch level without importing / exporting back and forth. 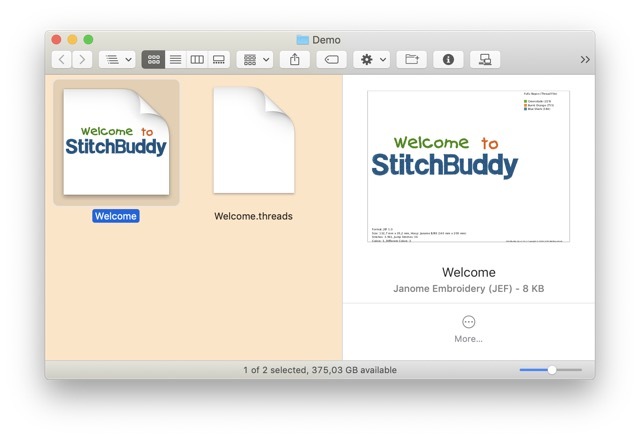 On iOS a background process will work on StitchBuddy's document folder, automatically converting all .threads files into extended file attributes and removing the obsolete files. Unfortunately this approach is not applicable on macOS: You will be asked to delete the .threads file when saving a file with a vendor's thread chart. The current design will keep this information without any additional file, but other designs with the same name (but a different format) might be affected. This effect is similar to the current "Discard Thread File" function. I will publish a corresponding FAQ article once the updates are released. Update (2019/04/06): I had to learn that the new way to save thread information does not survive an iCloud synchronization - although Apple's documentation claims it does. Developer Technical Support asked me to file a bug report … done. Until the issue is resolved this improvement is put on hold, and for now I have to keep the old .threads files.